Bill Gates touched my Mac Book Pro. In the past few weeks, I’ve been itching to learn some new stuff. Those who know me even just a little bit know that “new stuff” is generally going include “new ways of creating graphics and/or animations”. And so it does this time. 1. It sometimes seems silly to pipe everything through the browser all the time. I’d like to just be able to run a program and have it create a file and display that file. 2. Running in the browser via the file system introduces various security issues, so you need to run some kind of local server, and even then you run into issues with saving files to disk automatically, so you need to right click and save or set up some kind of button to save an image. 3. At work, I’m using React with Webpack and Babel, so I get to use the latest and greatest ECMAScript with classes and all the other syntactic sugar. It’s really nice, but setting all of that up is not trivial. For a one-time large project, it’s not a huge deal to spend some time on creating all that config. But if you’re going to be doing random experiments all the time, it’s a ton of overhead. I get stuck with whatever the current browsers implement. So I’ve been looking for some other language / drawing api I could learn. After a short amount of searching, I came across Cairo Graphics. It’s a 2D graphics library, written in C, but has bindings for several other languages. Well, that sounds pretty cool. 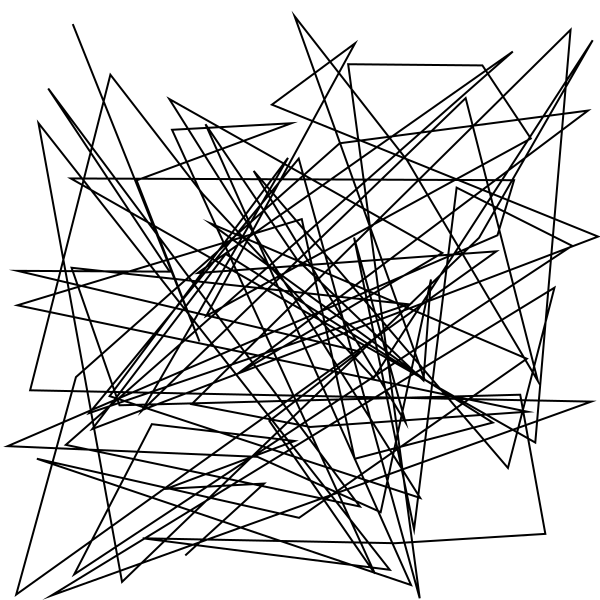 Looking over the tutorials and api documents (https://cairographics.org/manual/), I see that you create a surface, then get a context from that surface, then call various commands on the context such as move_to and line_to, and then follow up with stroke and/or fill. Well that sounds awfully familiar. In fact, I’m going to guess that HTML5’s Canvas is either backed up by Cairo at some level, or is at the very least inspired by Cairo’s api. At any rate, it sounded worth looking into. I wasn’t about to dive into C programming, but as I mentioned, there are bindings for several other languages. The first I tried was Python, and that worked great. I’ll probably do another tutorial on pyCairo at some point, but I wanted to take it a little further and really dive into something new. I’ve had my eye on a couple of languages – Rust and Go. Both have Cairo bindings, so I flipped a coin and decided to try out Rust. Rust is a pretty interesting programming language. It’s built around speed and safety – preventing you from doing bad things. As such, it has some programming paradigms that seem really strange at first. But there’s a lot of logic behind those decisions. I’m not going to do a Rust tutorial here. But the documentation on how to learn the language is some of the best learning material I’ve seen on any site for any language or system. I’m going through the Second edition, which is still listed as “under construction”, but I haven’t run into any flaws or incompleteness as of yet. What I do want to cover in this tutorial is using Cairo in Rust. There’s a lot resources on how to use Cairo, lots of stuff on how to use Rust. But the center part of the Venn diagram is rather thin. 1. 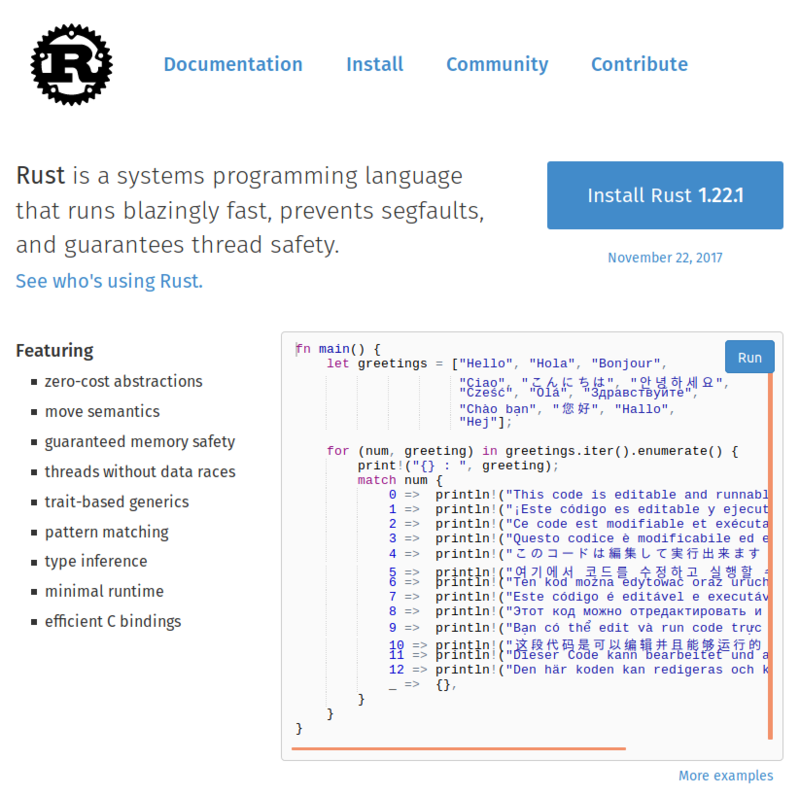 Install Rust and learn how to program in it. At least the basics. I had to read maybe 1/3 of “The Book” before I felt I was ready to start trying to pull in the Cairo bindings and create some graphics. 2. Install Cairo. This is the C library itself. It needs to be on your system so that the Rust bindings for Cairo have something to bind to. On MacOS, it seems you’re supposed to use MacPorts, which I’m not really familiar with, or fink, which I’ve never heard of. On Windows, it looks like you just have to add a few dlls to your path. OK, we’ll carry on, assuming you got Cairo installed. 3. Create a project and set up the dependencies. Again, this is not a Rust tutorial, but to create a Rust project, you can use cargo new. This creates a new project named cairo_stuff, which will be a binary executable, (bin) as opposed to a library project. The authors data is taken from your .gitconfig file if you have one. We need to add our Cairo binding as dependencies for this project. To do that, we list them under dependencies. We’ll need two packages or “crates” as they are called in Rust. We’ll need the png crate so we can save images, and the cairo-rs crate which contains the actual Cairo bindings. 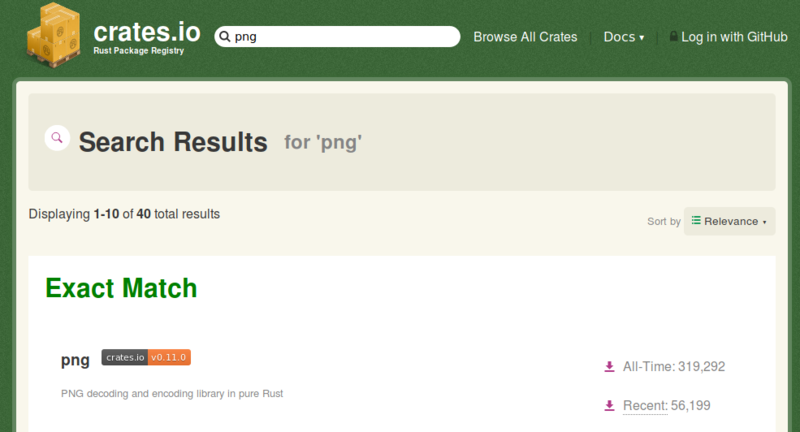 We also need to add png as a feature to cairo-rs, so that cairo-rs itself knows how to save pngs. Whenever you’re doing dependency configuration in any language, it’s important to have a way to know what versions of different dependencies are available. In Rust, you can go to https://crates.io and search for the package you want to add, in this case, “png”. The first match tells us that we want version 0.11.0. And for cairo-rs, it’s 0.2.0. Note, these will definitely and continuously change, so actually go to the site and check the numbers. Again, read “The Book” to fully understand all the syntax here. But this will get you up and running. If you’ve done any kind of programming, all that should be pretty self-explanatory. You have a function called main. Rust follows the pattern of many other languages where main is the function that is called when the program is executed. At this point you can call cargo run from the main project directory. This will satisfy all your dependencies, build the executable, and run it. It should print out the message “Hello, world!”. Great! It probably took a while to download everything it needed. But if you run it again, it should complete almost instantly. If you now look in your project folder, you’ll see you have a Cargo.lock file and a target folder. The target is where your final executable and all the build artifacts are. The lock file lists all the other dependencies that got pulled in when you added png and cairo-rs. For me, this file wound up at 171 lines, so there were quite a few other libraries it needed to pull down to satisfy those two that we added. Now that we’ve set things up, let’s draw something. 1. Create an image surface. 2. Create a 2D drawing context that references that surface. 5. Write the surface to the file as a png. For most of your projects, steps 1, 2, 4 and 5 are going to be boilerplate. The meat is going to be step 3 where you draw the actual content you want to draw. 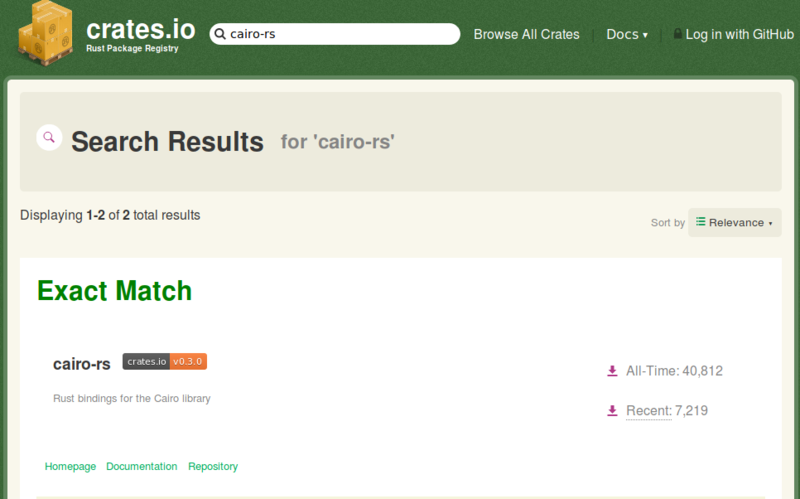 Note that although the crate name was cairo-rs, we just link to it as cairo. So ImageSurface has a method named create which gets a format, width and height and creates a new surface. The format will have four channels – a, r, g, b – each 32 bits. But actually, this is not quite right as it stands. The ImageSurface::create method does not directly return a surface, it returns a result because this call may fail. Maybe you don’t have enough memory to make a surface the size that you requested for example. So you need to check the result to make sure that it’s valid before proceeding. There are a few ways to handle that result and get at the surface. Rust provides a quick shortcut to let us do this in one step: just call expect, passing in a message string. If the call succeeds, it will pass through the newly created surface. If it fails, the program will crash, displaying your message. Now, obviously, this is not great error handling for a program you’re going to release into the world, but it’s good enough for a first pass of something you’re testing out. Now we create a context based on this surface, assuming it gets created. Now we have a context to draw stuff on! Let’s start by painting it red. set_source_rgb takes three normalized floating point values. paint fills the context with the current source value. So how do we see this thing? The program we are creating has no UI. It just runs on the command line. We can’t just display the image in a window, because we have no window. We can save it to a file though. First we need to create a file object. That would be std::fs::File. We can use use up at the top to shorten that in our code. The mut there means this is a mutable variable. It can be changed. By default, variables are immutable in Rust. Our next line will require a mutable reference though, so we make file mutable. Again, this call may fail, so we tack on expect with a message string so that we get a file not a result, and we’ll crash if this fails. The write_to_png method needs a mutable reference to a file object. μt file is how we specify that (see “The Book”). And once again, we check the result. When you run that, you should wind up with a file called ouput.png in the main project directory. It should be a 600×600 red square. OK, OK, filling a png with a single color is not really drawing. Let’s get a taste of the drawing api itself. I’m just going to throw the whole file at you and let you figure it out. Again, the top and bottom of this file is mostly boilerplate. After we create the surface and context, we paint the surface white this time, and use a for loop to draw 100 lines. This is done with context.line_to. Note that we’re using a random number generator here. That’s another crate. Up top I’ve imported that with extern crate rand; I’ll leave it up to you to search https://crates.io to find the current version and add it to your .toml file. Now the random functionality gets a bit wordy here, with specifying the type each time (f64 = 64-bit floating point number). But you’re probably going to want to create your own random range function anyway, so you can say random(min, max) and get a result in that range. When you do that, you can just abstract the actual random call within that function. I’ve already said it enough, but read “The Book” if you want to learn more about Rust. It’s really that good. A lot of those will look really familiar if you’ve been working in HTML5 Canvas. move_to, line_to, curve_to, arc, rectangle, etc. And once you’re familiar with Rust and cairo-rs, you should be able to go to any C-specific Cairo documentation and figure out how that can be translated over to Rust. But it’s not really. Installing Rust and Cairo itself may have taken a bit, but those are one time actions. Once they’re on your system, you’re done. From there, a new project is as simple as running cargo new and adding two lines for the dependencies. For the source file, you can create some kind of snippet or template for all that boilerplate stuff and you’re off to the races, writing drawing commands in under a minute. Anyway, hopefully this starts you on some kind of journey of learning something new. I follow your flash blog about 10 years ago. You are awesome! Thanks.